Powers/Abilities: Amanda knew witchcraft but the real extent of her powers is unknown. 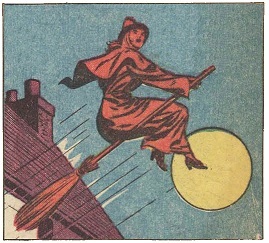 She could cast spells and charms and was able to fly on a broom. 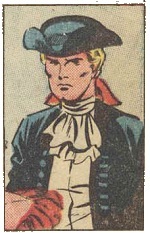 History: (Journey into Mistery I#58/3) - It was the 18th century when Amanda Dalton arrived in Salem. She was a witch but hid her powers, instead settling in town as a seamstress. During Amanda's life in Salem, a ship, the Golden Fleece was wrecked, a witch had cast a spell on the ship. After few weeks in Salem, Amanda was almost convinced that she could live well there when she saw a little crowd shouting to and cursing a woman. They told Amanda that the woman was a witch and that this was the way they treated witches, driving them away from Salem. Few days later Amanda met John Redmond by accident. They kept on seeing each other and eventually fell in love, but their relationship was noticed by Evelyn. Evelyn and John ware keeping each other company before John met Amanda and Evelyn became jealous. One day Evelyn threatened Amanda, telling her to leave John alone, but Amanda didn't consider it a serious problem until Evelyn spread the rumor that Amanda was a witch and gathered a crowd before Amanda's house to carry her away. Evelyn claimed to having seen Amanda performing sorcerous feats by night and to be guilty of the sinking of the Golden Fleece ship. John Redmond appeared before the crowd and exposed Evelyn's jealousy, making her appear as a liar, claiming also that he would never believe in witches. When the crowd dispersed John asked Amanda to marry him. Even though she loved him she refused because she was actually a witch. That night Evelyn left Salem and a week later so did John Redmond. Amanda had caused enough trouble around so she left as well. Comments: Created unknown writer, Jack Kirby (pencils) and Joe Sinnot (inks). It is unclear whether the sinking of the Golden Fleece was really caused by Amanda. It was a witch for sure, but I lean for the one banished by the crowd. The kind of problems caused by Amanda were love troubles. John Redmond was a normal human. John Redmond was a handsome and very rational man. He strongly did not believe in witches and sorcery and hated superstition. John Redmond met Amanda Dalton by accident. While riding he splattered mud on Amanda's dress. Then he was Evelyn's beau, but afterward he started meeting Amanda. He fell in love with Amanda and he firmly defended her in front of the crowd, however his beliefs in the non-existence of witches were too strong and Amanda refused to marry him. Evelyn was a normal human. Evelyn was in love with John Redmond until he left her and started keeping company with Amanda Dalton. Jealous, Evelyn threatened Amanda. Days later Evelyn claimed to having seen Amanda performing mystical rites just in the night that the Golden Fleece sunk. The people of Salem believed her but when John exposed Evelyn's jeaousy, they changed their mind and were not so sure about Amanda's charge, so they allowed her to stay in Salem. Heart-broken Evelyn left the town that same night. The unidentified witch had sorcerous powers. She could control the elements like wind and rain. She could control the sea and probably also spread sickness. When she used witchcraft she appeared as an old, long-nailed, green-skinned, long white-haired hag. It is unclear what her real aspect was. She used her powers to cause disasters like ship wreckages and crop dryness. The witch performed a mystical rite with incense and with a cauldron on fire and cast a spell on the Golden Fleece, causing sea and wind to shatter the ship on rocks. 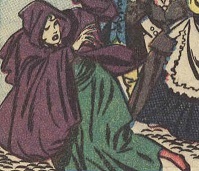 Somebody saw her however during one or more rites, so she was assaulted by Salem's people, and was banished from town.